Organic Book Reviews - Which ones are Recommended. As you and most people know everyone wants to learn more about organic and are turning to Organic Food, Organic Skin-care, Organic Gardening, Organic Meat, and Organic Clothing, and eager to get back or start to live a Healthy Way. Here’s Why You Should Too!! This book, The Ultimate Organic Lifestyle is a book on extensive organic information covering the complete concept of an organic lifestyle and how to convert to organic living and better health. Here is a Complete Review on the Organic Lifestyle Book. When I first saw the website for this book, I was skeptical. I thought it will be just another collection of well known home herbal remedies. But I bought the book anyway, because I have studied medicinal herbs and herbal medicine for years and collect all resources I can find on the topic. The book surprised me. The recipes included were very simple, most of the ingredients were already in my kitchen or I could buy them in a local supermarket or fruit and vegetable store. 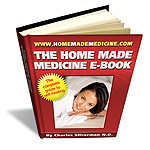 Here is my review on Home Made Medicine E-Book. TRANSITION INTO ORGANIC FOODS explains that there is also a difference between organic versus natural foods and as a bonus includes the author's favorite recipe for organic oatmeal cookies. A grocery list is included to help the reader see the variety of organic food choices available and resources are also provided to help locate organic food markets. The book concludes with a survey which encourages readers to try out different organic fruits and rate them. TRANSITION INTO ORGANIC FOODS is a compelling fact-based read which is written in a simple, easy to understand format, that guides the reader to a better understanding of the basic differences between conventional, organic and natural foods. With its decidedly appetizing cover design, this book is best suited for readers interested in changing their eating habits. This very informative, concise book answered many important questions regarding my daily diet. For example: "... so is that why many of the fresh fruits I used to enjoy on a regular basis are causing an allergic reaction?" This book points out the problems, explains the "why's" and offers easy steps to follow to reach a realistic solution on how to improve what you eat. I am glad I read it and will use the recommended grocery-shopping tips for my next visit to one of the recommended grocery stores! Here's the perfect introduction for people who want to go organic but don't know how to get started—or aren't always sure they know what "organic" means. Teaching kids the benefits of organic living. A concluding chapter points out the limitations of going organic and offers a few simple rules to live by. The book features approximately 250 illustrations, all in full color. Food shopping should be fun, but these days it’s downright confusing. Just trying to eat well and make healthy and nutritious meals for our families has gotten more and more complicated. Hormones, pesticides, antibiotics, mad cow disease, genetic modification - what impact do these issues have on our diet, our health, our waterways, our soil? How can the average person sift through confusing labeling, conflicting news reports, and unfamiliar terminology in order to select foods that are truly healthy and nutritious? With The Organic Food Guide, Steve Meyerowitz, aka “Sproutman,” author of nine other books on diet and nutrition, guides you through this maze of tough health issues and new food choices. He steers you to healthier foods and shows you how to find the bargains, too. Well known for both her family (she's the daughter of Paul Newman and Joanne Woodward) and her food (the Newman's Own brand of sauces, snack foods and other delights), Newman here joins forces with Discover contributing editor D'Agnese to offer this well-reasoned and practical handbook to environmentally and socially conscious living. Her suggestions cover such areas as food, transportation, energy and investing, and range from the commonsensical-eat local produce in its season-to the surprising-stock your living room with the 10 plants that "clean air best." Newman assumes her readers aren't zealots, but simply people who want to do right by the earth, and it's this lack of self-righteousness that makes her advice so refreshing. Whether readers want to learn how make nontoxic household cleaners, buy "green power" from the power company, shop more responsibly, practice "social investing" or to encourage their pets to eat organic people food, Newman offers the secrets. The Whole Foods Market has been a pioneering natural-foods-oriented alternative supermarket since it opened in 1980, and their broadly appealing cookbook reflects a gourmet approach to healthy food. Appetizers such as the Spicy Chickpea Patties with Cilantro, Lime and Chilies and such soups as Sweet Potato, Corn and Kale Chowder have flavor kicks often missing from other health-conscious cookbooks. One-Pot Meals such as Spicy Mac and Cheese and Thai-Style Green Curry Chicken abound, along with hearty salads and sandwiches like the Mediterranean Tuna Salad and the Mushroom Goat-Cheese Quesadillas. Naturally, there are plenty of vegetarian and vegan recipes, such as Kung Pao Tofu and vegan French Onion Soup. Main courses such as Athenian Chicken Roll-Ups, Lime Seared Scallops over Baby Spinach and Firecracker Shrimp emphasize fish and white meats. Sauces and dips such as the low fat Buttermilk Ranch dressing and the Spinach Artichoke dip double as marinades or toppings. The uneven Cooking with Kids chapter is sandwiched between some great smoothie and drink recipes, and to cap it off there's a dessert chapter with Lemon Lime Bars and Unbaked Brownies. Recipes include nutritional information. A glossary and information panels throughout the book explain how to do everything. Breakfast in Bed, praises the flavor and health benefits of organic produce. A section titled "Why Organic?" explains that "before 1900, all food was organically grown," so the fad for heirloom tomatoes is really a return to the food-raising practices of centuries. Cool proudly relates that she raises chickens in the backyard of her suburban Palo Alto home, which is known as the best after-school-snack house among her son's friends. After the first two chapters, which explain how to shop for organic produce, readers may head straight for the closest co-op. However, recipes are organized into eight mini-seasons, so if you're wondering what you should do with those early springtime fresh strawberries, or those portobellos you impulsively bought, recipes such as Strawberry-Chocolate Cobbler and Stuffed Portobello Burgers, with easy instructions and tips, will help.